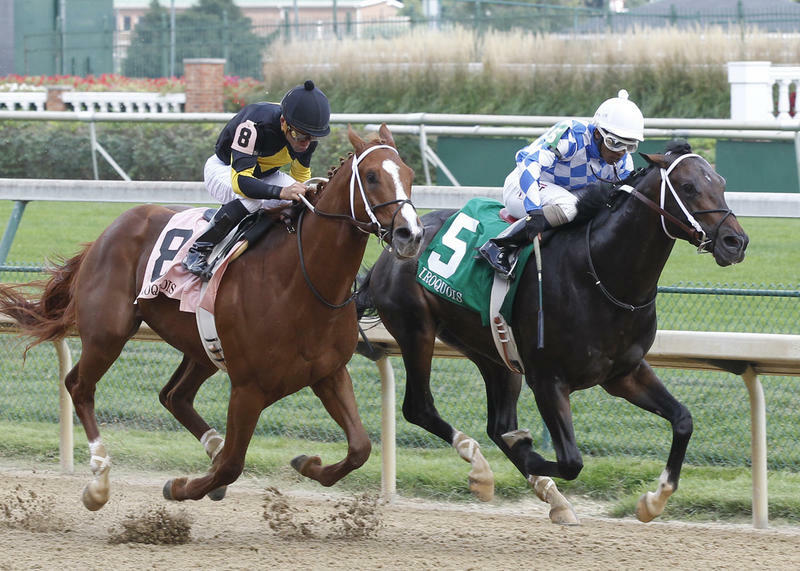 Lucky Player (inside) and Bold Conquest (outside) ran 1-2 in the 2014 Iroquois at Churchill Downs. Credit: Reed Palmer Photography. Conquest Stable LLC’s impressive newcomer Conquest Windycity and a pair of stakes winners in Liam F. Benson’s Expected Ruler, winner of Monmouth Park’s $60,000 Tyro Stakes as a 47-1 longshot in his only career start, and Richard Ravin and Patricia’s Hope LLC’s Cocked and Loaded, winner of Belmont Park’s $250,000 Tremont Stakes, head a field of a dozen 2-year-olds set to take their first significant steps on the 2016 “Road to the Kentucky Derby” in Saturday’s 34th running of the $150,000 Grade III Iroquois Stakes Presented by U.S. Bank at Churchill Downs. The 1 1/16-mile Iroquois, one of four stakes events scheduled for the first Saturday of the third September Meet at Churchill Downs, is the first scoring race on the 2016 “Road to the Kentucky Derby,” the points system that will ultimately determine the members of the field that will compete in the 142nd running of the Kentucky Derby Presented by Yum! Brands (GI) at the Louisville track on Saturday, May 7, 2016. The Iroquois also is part of the Breeders’ Cup “Win & You’re In Juvenile Division” and its winner will earn a guaranteed spot in the starting gate for the $2 million Sentient Jet Breeders’ Cup Juvenile (GI) at Keeneland Race Course in Lexington, Ky. on Saturday, Oct. 31. Pre-entry and entry fees to the Juvenile will be waived for the winner, who also will receive a travel stipend for his journey to Keeneland for the race. The race is scheduled as the ninth event on an 11-race Saturday program with its first race scheduled for 12:45 p.m. (all times EDT). The entrants in the Iroquois are scheduled to break from the starting gate at 4:49 p.m. 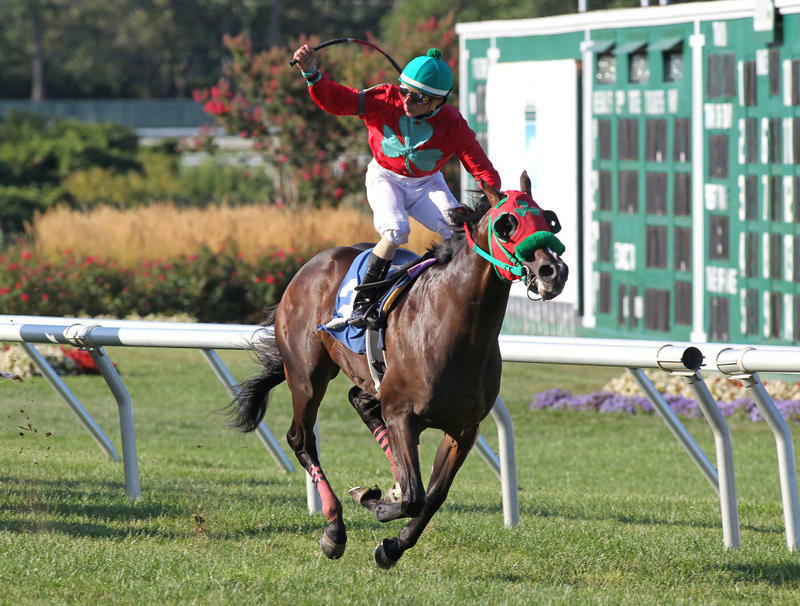 The Iroquois shares Saturday’s spotlight with the 47th running of the $200,000 Pocahontas (GII) for 2-year-old fillies, a 1 1/16 mile event that kicks off the “Road to the Kentucky Oaks” points system that will determine eligibility for the $1 million Longines Kentucky Oaks(GI) on Friday, May 6, 2016. The Pocahontas is part of the Breeders’ Cup “Win and You’re In Juvenile Fillies Division” Challenge, with its winner earning a guaranteed entry into the $2 million Breeders’ Cup Juvenile Fillies (GI) on Saturday, Oct. 31. Starting time is set for 4:18 p.m. for the Pocahontas, which will be the eighth of the day’s 11 races. Other stakes races scheduled for Saturday’s program are seventh running of the $100,000 Open Mind, scheduled as the fifth race at 2:45 p.m., and the 32nd running of the $100,000 Locust Grove (Listed), which is the 10th race and is set to start at 5:20 p.m.
Conquest Windycity is the 7-2 favorite for the Iroquois in Mike Battaglia’s morning line odds although he is one of five entrants who come into the race without a victory in their young careers. The son of Tiznow, an $800,000 purchase at the 2015 Ocala Breeders Sales Company’s March sale of 2-year-olds in training, finished a strong runner-up for trainer Mark Casse to Monster Bea in his lone start in a swiftly-run 1 1/16-mile maiden race on the Saratoga turf. Shaun Bridgmohan will ride Conquest Windycity, who will break from the rail post under 118 pounds. 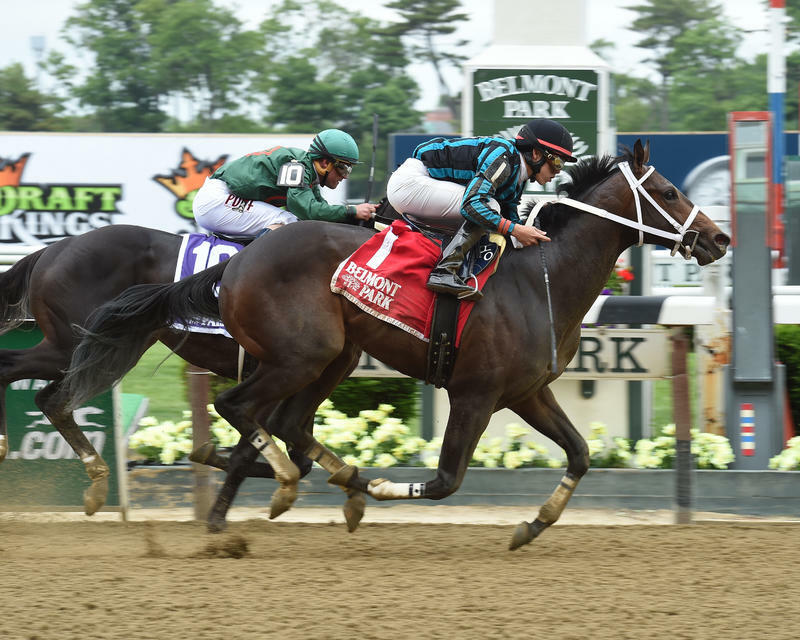 Homebred Expected Ruler rallied from sixth for a 2 ½-length win in his Tyro shocker over the Monmouth Park turf course and is the 9-2 second choice in the Iroquois morning line. He is trained by Liam D. Benson, the 20-year-old son of the colt’s owner and breeder. Although the Iroquois will be his debut on dirt, there is hope in the pedigree of the Florida-bred son of Leroidsanimaux (BRZ) that Expected Ruler will successfully adapt to the new surface. Animal Kingdom, also a son of Leroidsanimaux, scored his first victory on dirt in the 2011 Kentucky Derby after competing on grass and synthetic courses prior to the Run for the Roses. Jockey Wilmer Garcia rode Expected Ruler in his Tyro triumph and will be back in the saddle in the Iroquois. The colt will carry co-high weight of 120 pounds when he breaks from post three. Cocked and Loaded won his racing debut at 4 ½ furlongs on April 15 and rallied to take the 5 ½-furlong Tremont in his next outing on June 5 at Keeneland. The Larry Rivelli-trained son of Colonel John will be looking for a return to the form of his first two races in the Iroquois after dull efforts as the betting favorite in a sixth-place run in Saratoga’s Sanford (GIII) and a fifth-place finish over the synthetic Polytrack surface at Arlington Park in the Grade III Arlington-Washington Futurity (GIII) on Aug. 22. Cocked and Loaded shares high weight of 120 pounds and will be ridden from gate five by Emmanuel Esquivel. Outside of the top three choices in Battaglia’s morning line, four of the remaining nine horses entered in the Iroquois will be looking for their first career victory as well as a successful run in stakes competition. Winners looking for their initial stakes success in the Iroquois include Albaugh Family Stable’s Unbridled Outlaw, a recent winner at Ellis Park for trainer Dale Romans and the 4-1 third-choice in the Iroquois morning line; the Kenny McPeek-trained duo of Magic City Thoroughbred Partners’ Meeteetse Fly and Radar Racing LLC’s Rated R Superstar, who are coming off wins on turf and dirt, respectively, at Ellis Park; George and Lori Hall’s Baychimo, a Kelly Breen-trained Mizzen Mast colt who won his most recent start at Monmouth Park; and Steve Landers’ Twirling Cinnamon, a winner in his Churchill Downs debut for trainer Brad Cox who finished eighth next time out in his stakes debut in Saratoga’s Sanford. Promising colts who are seeking both their first victory and stakes triumph in the Iroquois include Robert Baker and William Mack’s Condominium, a son of Tiznow who was runner-up in his most recent start at Saratoga for Hall of Famer D. Wayne Lukas; Calumet Farm’s homebred Star Hill, third in his Saratoga debut for trainer Rusty Arnold; Silverton Hill LLC’s Missile Bomb, third in the Arlington-Washington Futurity to Shogood for trainer Darrin Miller and runner-up to that rival in his career debut at Arlington Park; and Charisma Stable LLC’s Dothat Dance, winless in three races for trainer Jimmy Corrigan. The Iroquois field, from the rail out (with jockey, weight and morning line odds): Conquest Windycity (Bridgmohan, 118, 7-2), Meeteetse Fly (Joe Johnson, 118, 15-1), Expected Ruler (Garcia, 120, 9-2), Condominium (Jon Court, 118, 6-1), Unbridled Outlaw (Corey Lanerie, 118, 4-1), Cocked and Loaded (Esquivel, 120, 10-1), Star Hill (Jose Ortiz, 118, 10-1), Dothat Dance (Marcelino Pedroza Jr., 118, 30-1), Missile Bomb (Victor Lebron, 118, 12-1), Rated R Superstar (Calvin Borel, 118, 8-1), Twirling Cinnamon (Brian Hernandez Jr., 118, 12-1) and Baychimo (Paco Lopez, 118, 30-1). Saturday’s National Weather Service forecast for Louisville calls for partly sunny skies with high of 71 and a 20-percent chance of showers.